After a long winter day or a tiring week, a hot meal sounds enticing — but preparing one can sound overwhelming. Skillet meals are the perfect solution for days like this. You simply combine everything in a cast iron pan, heat up the oven, and pop it in! Slice carrots lengthwise and chop kale. line bottom of the skillet with kale, and lay carrots in the center. Scatter full garlic cloves. Slice hempeh into chunks and lay inside of skillet. Sprinkle everything with herbs, salt and pepper. 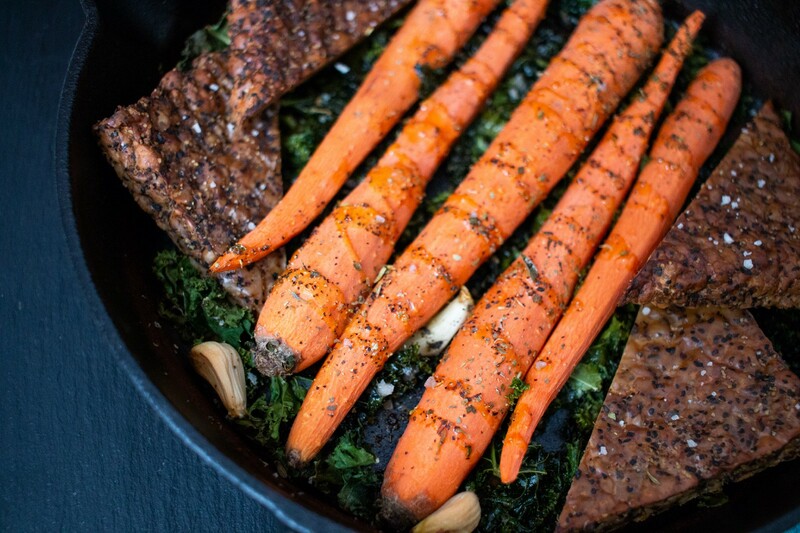 Roast for 20–25 minutes, until carrots are well cooked and hempeh is brown and crispy on the outside. Remove from heat and brush with CBD ghee if desired. Enjoy!